In the War on Waste, we can each do our part. There is no such thing as "AWAY" so when we produce waste it has to go somewhere! Plastics particularly are a major problem because they don't break down like natural materials, they stay - often for hundreds of years, polluting and killing wildlife. THE FOUR R'S are a great tool to fight not only the volume of plastics going into our world, but other waste too. Take a look at the headings for ideas on how to follow the FOUR Rs. Links to each one are below the FOUR Rs heading above. 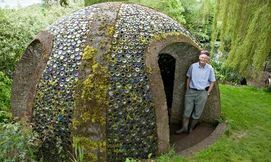 The Bottle Dome, built by Richard Pim from Pembridge, resembles a concrete-and-glass igloo made of 5,000 reclaimed glass bottles set between crossed arches. He describes his dome as being like a huge hot-cross bun adding: "Some part of the glass hemisphere directly faces the sun at all times of the day, giving an extraordinary sparkle which is reflected in an interior pool. It is a feature for my garden. I made every part of the dome myself – and emptied a good few of the bottles." Everyone is very welcome to come and join our group. We aim to support and encourage each other to make the most of what we already have rather than buying new. Above all, it's fun and creative. Not in the making mood? Come along anyway for a cup of tea and a biscuit and just observe what goes on. A great resource at Blackpole, Worcester! http://www.wre.uk.com/ is stacked full of materials that would have gone to landfill from local businesses but instead is available to members for an annual fee. What they say " Our materials change constantly but we often have paper, felt, cardboard, shiny film, sticky backed foam, plastics, fabric, tubing and much, much more! You never know what new things we might have from week to week, and this makes the scrapstore worth visiting regularly or keeping up-to-date by email or in our blog section. Alongside these resources we also sell other reclaimed materials. There is a selection of household paint in our Community RePaint area, and our wood store regularly contains plywood, MDF, chipboard, skirting and other lengths of timber."